As I was sitting there yesterday watching my 2-year old nephew, I noticed something as he was busy squatting down and moving rocks from one place to the next (a game he thinks is incredibly fun). He had PERFECT squat form. 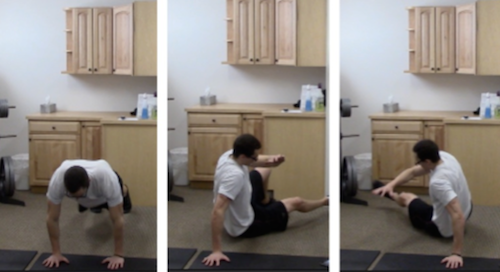 No tight hips, no weak spots, strong lumbar, great foot position, etc. It was flawless. And it was flawless every single time he squatted down. As we get older, start sitting more, moving less… We lose mobility and that “effortless” factor when we squat. Personally, my hips are incredibly tight making it very difficult to squat low like our picture above. Yet, the squat is one of the most important (if not the most important) exercises that you can do. Whether this be bodyweight squats, barbell squats, front squats, goblet squats, etc. Although they mainly target your legs (quads, hamstrings, flutes, calves, …), when done properly, squatting will release two very powerful muscle building hormones that will ultimately allow you to build more metabolic muscle throughout your body. When you squat, the body produces great amounts of Testosterone and Growth Hormone leading to more lean muscle and less fat. And the best way to continue producing more Testosterone and Growth Hormone in your squatting sessions, is by getting STRONGER on your squats! Have you ever heard the saying… “Train like an athlete, LOOK like an athlete.” The squat is an athletic movement that allows you to add more power, speed, strength, explosiveness, and more. In short, it helps you be more athletic no matter what age. And the more athletic you are, the more metabolic muscle you will have and the less fat you will have. Contrary to what you might think, the squat can help eliminate knee and back pain by strengthening the muscles around those two areas. Usually when people complain that squats hurt their knees or back, it’s because their form is off causing them to put more pressure on areas that cause the pain. 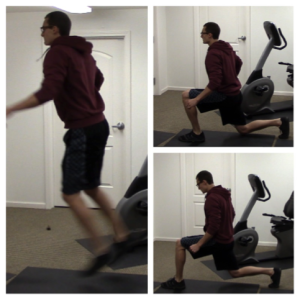 When you squat with the right form, you will instead eliminate knee and back pain for good! 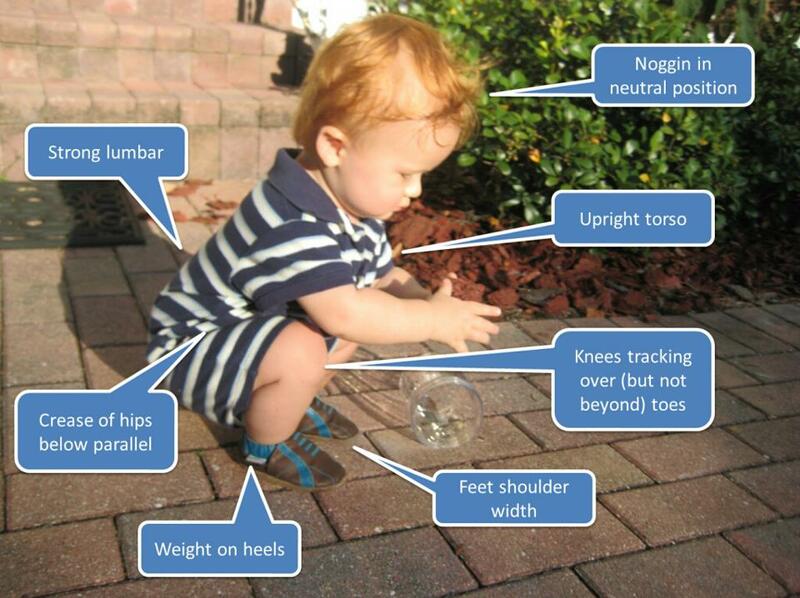 I’d love to be able to squat as low as my 2-year old nephew… Unfortunately, due to the amount of sitting I do for work (like many of you) my hips are very tight. Squatting forces your body to become more flexible, especially when you are working on improving your squat. The more flexible you are able to get, the stronger your squat will be. Here’s How You Can Double Your Squat In 6-Weeks <= Better flexibility, more strength, faster results! From an exercise stand-point, nothing beats the squat when trying to get lean and ripped. If you really want to take getting lean and ripped to a new level, try squatting and sprinting! Better than any traditional ab exercise, the squat (especially front squats) build your ab muscles incredibly well. They may not be as sore compared to regular ab exercises, but WOW! do they do they trick. Squatting recruits many different muscles, strengthening your upper and lower back leading to better posture. Front squats specifically, really help you avoid that “hunched back” while sitting at the computer. • Once beans are baked through, remove from the oven, cool and enjoy! Looking for more? Here’s part one and recipes 1-5! It’s all about the men today, and we are going to be talking the ‘Best Fat Burning Workouts For Men’ when it comes to seeing rapid results. So, before we get down to the nitty gritty of the 5 best fat burning workouts for men, let’s first (really quick) cover some fat burning nutrition. We all know the old saying that “abs are made in the kitchen” and that needs to be repeated over and over to many reading this right now. 1. Don’t drink your calories. Drink water. 3. Eliminate processed for 6-days a week. 4. Eat greens at all your meals. If you focused just on those 5, very simple nutrition rules, you will be well on your way to burning some serious fat. Nothing will get your body pumping with fat burning hormones like a solid strength training session. The key is to focus on BIG, compound movements that will active a ton of muscles which will lead to more caloric burn… Which in turn means… YOU burn more fat. For each strength session you perform, your focus should be on PROGRESS. This means getting stronger, more fit, more explosive, etc. The reasoning for this is simple… The stronger you are, the more lean muscle you will have and the LESS fat you will have. It’s quite an amazing cycle. 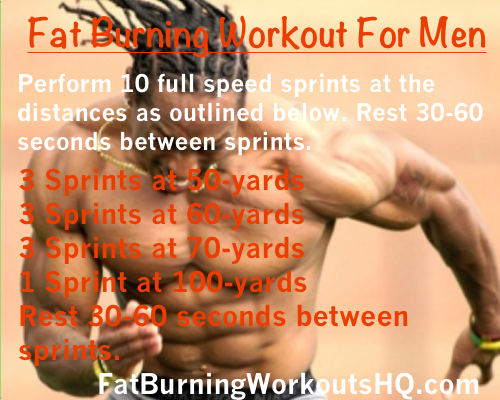 Also known as High Intensity Sprint Intervals, this is one of the best ways to boost your fat burning and once again keep the fat burning hormones in your body surging. Multiple research studies have proven that sprints naturally increase both Growth Hormone (GH) and Testosterone which leads to more fat burning and an increase in lean muscle growth. Just look at any sprinter or Olympic athlete… There is a reason they are so incredibly lean and ripped. Sprinting workouts do not have to be complicated or long to get the job done. Like the one below, many times it’s just going out and sprinting as fast as you can for a short period, resting and repeating. 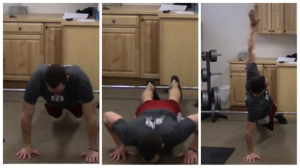 Bodyweight training is the PERFECT add on to any program that you do. It will help you increase strength and muscle endurance, and will give you that “cut” look in your muscles. Pushups, pull-ups, bodyweight squats, single leg bodyweight squats (and variations), burpees, mountain climbers, and more. There are HUNDREDS of bodyweight exercises to choose from and this is great for you because it allows you to add variety to your workouts. Here’s a 10-exercise bodyweight workout you can do right at home that will get your muscles burning, heart pumping, and fat sweating all in under 20-minutes! Want More Bodyweight ONLY workouts? Here’s a list of 37 programs at 97% OFF! You cannot have a “best fat burning workouts for men” list without having some kind of ab workout in there. However, this is NOT your typical ab workout as you will see. Instead, we are combining some high intensity exercises that indirectly target your abs and mixing them with direct ab exercises. Here’s 51 More Bodyweight Abs Workouts Just Like This One! AGH! Although I rarely recommend this, traditional cardio can be a great way to burn off those last few pounds of fat. There is a reason you see bodybuilders and physique athletes doing 30-60 minutes of slow cardio a day. Of course, if you don’t have time to do this, all I recommend you doing is 30-minutes of walking on a daily basis. If you’d like to learn more about the best kind of traditional cardio training, click here! I just want to say this… Getting fit, lean, and looking good naked take hard work, CONSISTENCY, and having the right plan in place. You should not be missing workouts, cheating on your diet, or skimping on sleep if you want the best possible fat burning results. For a full-on plan to get you extremely lean, here’s over 28 resources dedicated to getting you RIPPED! Whats YOUR favorite fat burning workout from above? Let me know below! When it comes to the perfect fat burning ab workout, you need to take into account three different aspects of training. Doing 100 crunches may give your abs that nice “burning” feeling, but when it comes to ab workouts that ALSO burn fat… You need more than just direct exercises. In today’s fat burning ab workout, you will be targeting our abs from three different angles. First, you will of course be hitting them directly. This means through exercises that target the abs directly to make them stronger and get that “pop” look. Think of direct ab exercises like sculpting your core. You are not necessarily burning a lot of fat during this part of the workout, but it will help later when burning away that final layer of fat. Second, you will hit your abs indirectly. This is done through exercises that focus both on building your abs AND burning the fat around your abs, at the same time. Think of those exercises like a hybrid movement where you will be feeling activating your abs while also burning up the fat around them. 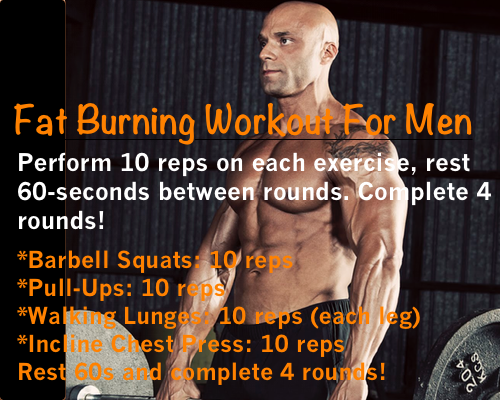 For today’s fat burning ab workout you will be doing 5 different exercises, then finish each circuit with a sprint. You will complete 5 total rounds as fast as possible, resting only when needed. SPRINTS! – Sprint 40-60 yards as fast as possible. Rest as long as needed and complete 5 total rounds! This workout right here, and the structure of this workout is the best way to train your abs. Not only are you focusing a few exercises on building your ab muscles, you are also focusing on burning the fat around your abs. For more fat burning ab workouts just like this one, go check out Superhero Abs System which is designed to get your abs showing in as little as 4-minutes! 1. Keep the abs braced and body in a straight line from toes to shoulders. 2. Place the hands on the floor slightly wider than shoulder-width apart. 3. Slowly lower yourself down until you are 2 inches off the ground. 4. Push off to return to the start position. 5. As you come up, rotate to one side and point that arm towards the ceiling. 6. Alternate sides with each rep.
1. Start on your back with hands placed behind your head with elbows out and feet straight out off the ground. 2. Bring your opposite elbow to the opposite knee and quickly return to the starting position. 3. Repeat on the opposite side and continue repeating in this alternating fashion. 1. Stand with your feet shoulder-width apart. Step forward with your left leg, taking a slightly larger than normal step. Keep your right toe on the ground and use it to help keep your balance. The right knee should also be bent. Lower your body until your left thigh is parallel to the ground. 1. Start lying on the floor with your knees slightly bend in front of you. 2. Crunch up engaging your core. Once you reach the top of your crunch, punch out to one side twisting in your core. Repeat on the opposite side by punching straight out and return to the starting position. 1. Keep your abs braced and body in a straight line from toes to shoulders. 2. Place the hands on the floor slightly wider than shoulder-width apart, BUT place one hand in front of shoulder level and the other hand behind shoulder level. 3. Slowly lower yourself down until you are 1 inch off the ground. 4. Push through your chest, shoulders and triceps to return to the start position. 5. Keep your body in a straight line at all times. 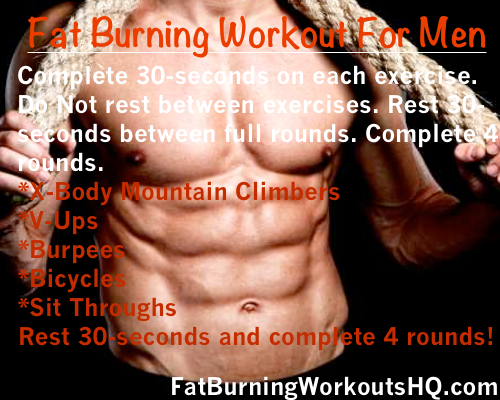 Looking For More Fat Burning Ab Workouts? Check Out My Superhero Abs Training System! 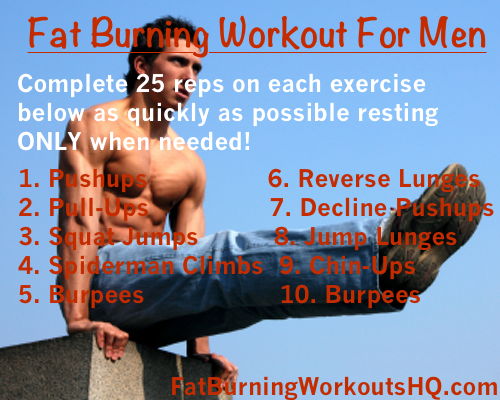 Can your REALLY have a 2-minute fat burning workout? I mean… Common… That’s just not possible… Is it? Well, although I don’t recommend simply doing 2-minute workouts all the time, I do think they are pretty useful every now and again. You can do them on an off day or place them as a finisher or just do them in your office for the heck of it. Whatever you decide to do, I think you will like this one today. It consists of just ONE single exercise and is the little brother (or sister) of our 4-minute fat burning workout. Set your timer for 2-minutes. You will then perform as many sit throughs as possible in the two-minutes. Make sure you count ALL your reps as this is going to be your total score. Each time your leg sits through, that counts as ONE rep. So, how many reps did you get? Talk about a challenging two minutes right? My guess is that you really felt that in your core and cardio. 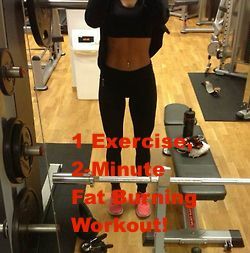 And that’s exactly what we are looking for when doing this 2-minute fat burning workout!